Since trying out Weleda's Sea Buckthorn Body Oil last summer and learning more about this all-natural skincare company with its 90+ year history, I've been a fan of the brand and what they do. So you can imagine how psyched I was to try their new One Step Cleanser & Toner ($24). Formulated to be gentle yet effective for normal to combination skin, this product promises to cleanse and clarify in a single step--perfect for busy gals who don't have a lot of morning prep time. The olive oil in the cleanser sweeps away traces of dirt and makeup, while anti-inflammatory, astringent witch hazel deep-cleans pores and soothes irritation. I've been using Weleda's One Step Cleanser and Toner for a couple of weeks so far. On the whole, it delivers on its promises. The heavy blue glass bottle reminds me of a hot sauce bottle: a plastic spout at the top only lets a couple drops out at a time and you have to shake the bottle a lot for a little product to come out. Because I'm so used to having suds and this formula didn't lather at all, I probably used more of the milky, liquidy cleanser than I needed. That being said, it cleanses effectively without drying out or irritating my skin. The fresh citrus scent (courtesy of essential oils), and the knowledge that the product tones my skin without any additional effort on my part--that's just icing on the cake. Interested in trying it for yourself? 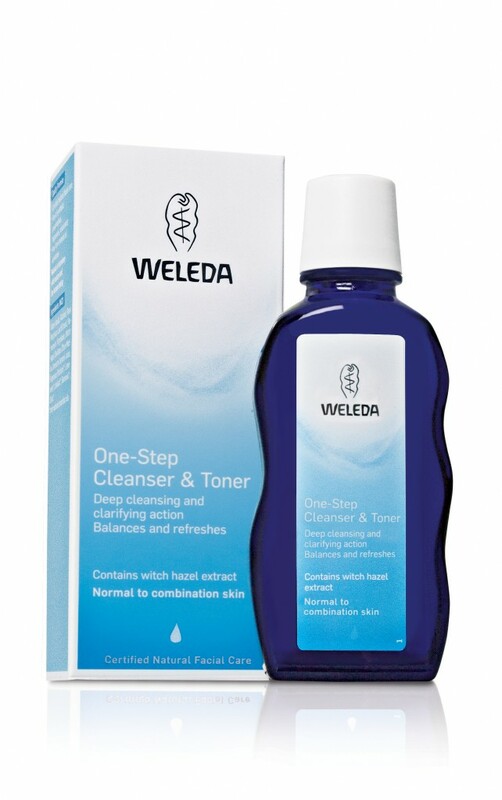 Weleda is giving one lucky Solo Lisa reader a prize pack which includes the One Step Cleanser and Toner. Simply leave a comment on this post with your contact info (email, blog or Twitter) and an answer to the question: "What do you do to save time in your busy day?" The giveaway ends Friday April 20th, 12 pm PST. One winner will be chosen randomly. Good luck! To save time I plan my outfit the night before! I run errands on my work breaks so I don't have to do them after work! I always plan my outfits the night before and use that extra bit of time in the mornings for a quick breakfast. I preportion and freeze fruit on weekends for quick smoothies during the week. I get my makeup and beauty tools ready the night before.